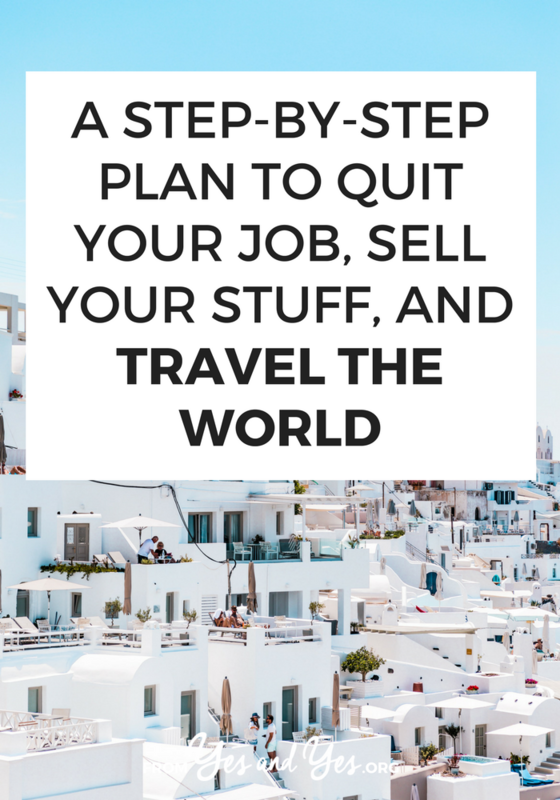 Have you ever wanted to quit your job and travel the world? On any given Tuesday, I’d imagine 30% of the workforce is having that exact fantasy. But where do you even start with something like that? Somewhat ridiculously, I’ve sold my worldly belongings and set out to travel the world five (!) times. Here’s a very basic break down of how you can do the same. How can you save that money? Where can you cut back? What places speak to you? Where do you have connections? Where can you travel cheaply? Can you take a proper sabbatical? How are you doing? Will you have enough saved by the time your departure date rolls around? What will the weather be like when you’re traveling – typhoon season? super cold? Can you have a leave of absence? Can you do any contract work for them while you’re abroad? How can you help make this transition easy for them? Is there anything from your home country that they’d like you bring? 5. Check in with the people you will be loaning things to. Is everything still on? Can they pick you up at the airport? If not, look into how much a taxi should cost from the airport to your hostel. Are the unofficial taxis safe? How much can you expect to pay for the train between Mumbai and Bangalore? Have paper copies of all this info in case your phone or laptop gets stolen, damaged, etc. Make sure all liquids are three ounces or smaller and are in a clear, plastic bag. 4. Cancel any applicable services – internet, cable, cell phone, etc. Have you ever traveled long-term? Share you tips in the comments! This is so helpful and inspiring – thank you! For me, though, the most baffling part is the actual selling of all of your stuff – how and where do you do that so that it is profitable but not a huge hassle? I did Craigslist for big/expensive stuff, yardsale for all the little stuff. And then brought all the leftovers to Goodwill! My only additional suggestion would be when you make copies of your passport, visa(s), etc, go ahead and make a pdf scan of them, as well as any other pertinent info you would sorely miss if you lost your hardcopies and email it to yourself or put on a flashdrive. You can password lock the document if you want to be extra safe. I did this before our eight month sailing trip and it was great to be able to print out extra copies of everything when necessary (like, say, every time we checked into a new port) or if my stuff was ever stolen. While scary to think about giving it all up and GOING, it really is a great idea and I recommend everyone to take that sabatical now and not later! We are a family that chucked it all over 2 years ago to travel and live in beautiful places. Selling our stuff was the first step after deciding to go and I've written quite a bit on the mental processing we went through before and after. One of the greatest gifts that we have acquired from NOT owning a lot of stuff is that we spend our money and time on experiences instead. And those have been priceless! Wow, this is definitely the voice of experience. There were tons of things I wouldn't even have thought of! I'm definitely keeping this in mind for the next trip I go on!